Valentine's Day activities are all around! Have you been cutting any hearts yet? Covered a box in paper for a Valentine's exchange? Bought cards for the kids to give out at school? 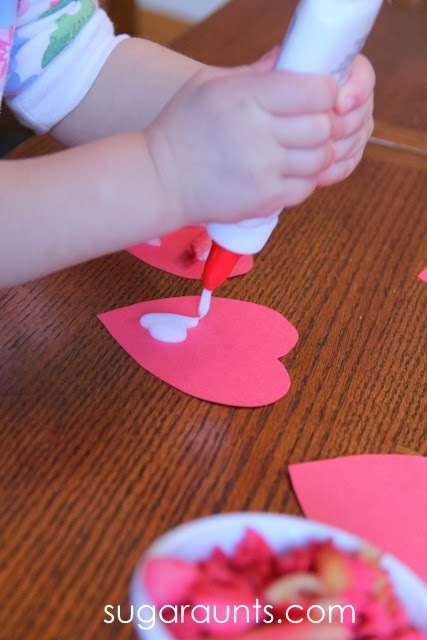 We've done a few activities...there was this Valentine's Day Painting and even a Valentine's Day Sensory Bin that you may have seen. 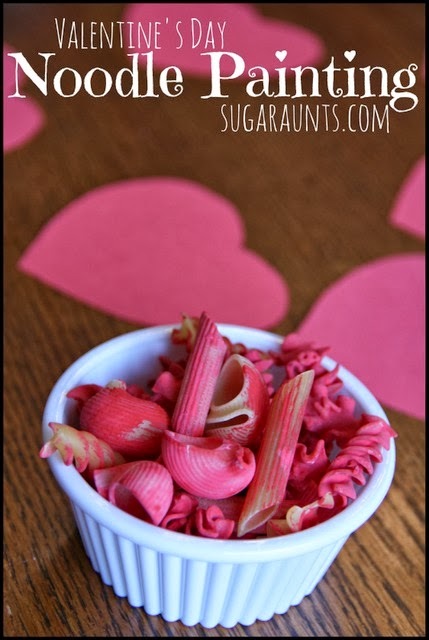 This Noodle Painting activity started out as a fine motor activity for Baby Girl and turned into a pretty Valentine's Day craft and decoration. Baby Girl got busy painting. She explored each noodle and had fun painting! Manipulating the little pastas was a great fine motor dexterity task...and very sensory too, as she covered her fingers with paint. 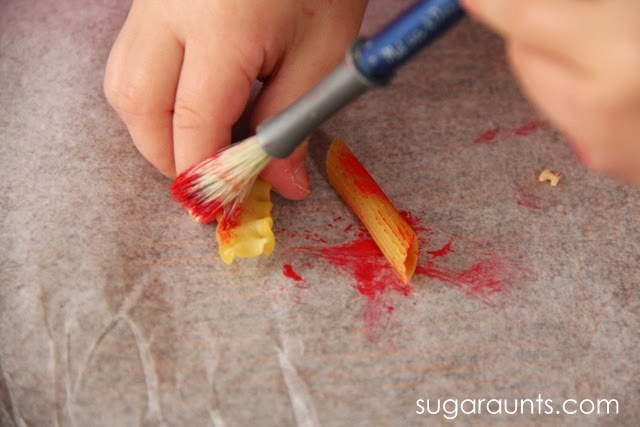 We let the painted pasta dry and ended up using it another day to make our Valentine's day craft. 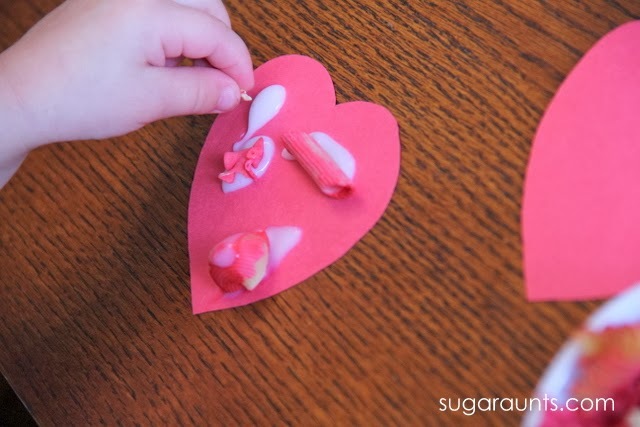 I cut some hearts from red construction paper and gave Baby Girl glue. She squeezed the glue all over the hearts...however she liked! 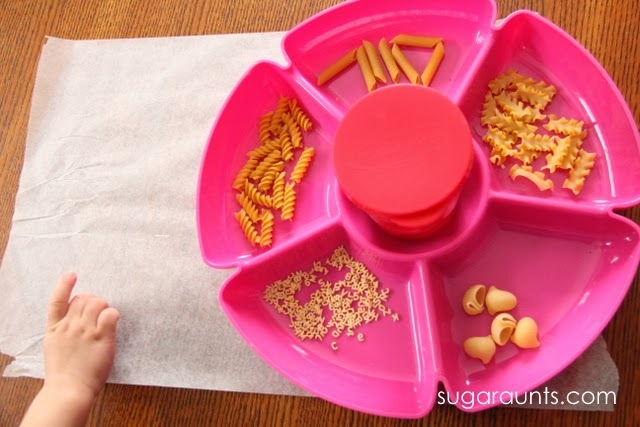 Squeezing glue is a good way to encourage hand strengthening in children. Squeezing the glue bottle requires a gross grasp on the bottle. A gross grasp is using the whole hand in a squeezing manner and really strengthens the muscles of the hand. She put the painted noodles in the glue with a tip to tip (pincer grasp). Picking up small objects with just the tips of the fingers requires precision and dexterity. The hearts dried and we strung them along a strand of yarn in our dining room. They make a pretty Valentine's Day decoration! 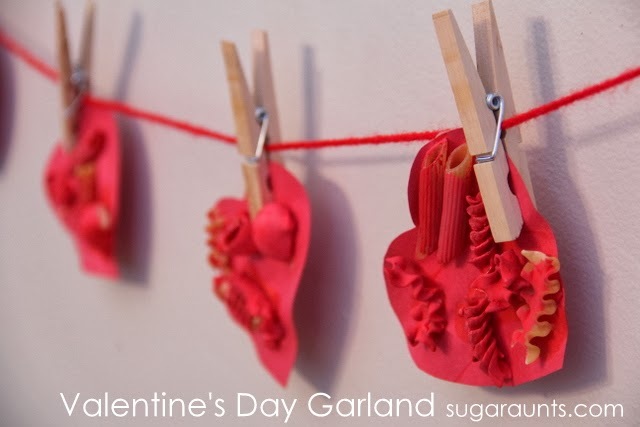 Follow Sugar Aunt's board Valentine's Day on Pinterest.